WataugaWatch: Did Chief Justice John Roberts Just Sass Our "Very Stable Genius"? Did Chief Justice John Roberts Just Sass Our "Very Stable Genius"? 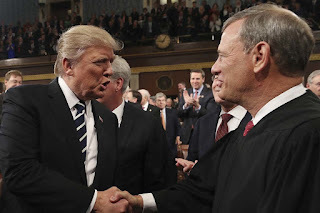 So you're telling me that because John Roberts said yesterday that an “independent judiciary is something we should all be thankful for” and that the U.S. doesn’t have “Obama judges or Trump judges, Bush judges or Clinton judges” -- you're telling me that John Roberts is our last best hope for saving the Republic? That scares the living cornbread stuffing outta me. Has John Roberts met Brett Kavanaugh yet, and is he saying that ole Brett is not a "Trump judge." Was he sober at the time? Has John Roberts met any of the other Trump appointees that Mitch McConnell is trying to rush through to populate the judiciary, those solemn legal minds that Twitterman chose because he thinks they'll approve of whatever he gets it in his head to do? John Roberts is our hedge against the vandals? Maybe. But there's another Defense Against the Dark Arts ... the next election cycle, when we can complete what we have begun.